﻿ Unofficial Project M Ridley PSA - Version 2.1 released. Kitty Corp Meow Mix Forums | Super Smash Bros. Brawl Hacking | Attacks and Animations (Moderators: KingJigglypuff, Large Leader) | Unofficial Project M Ridley PSA - Version 2.1 released. Question: What do you think of this hack (v1.9)? Unofficial Project M Ridley PSA - Version 2.1 released. Credits: KingJigglypuff for coding help and resizing and fixing model several times; themaziest (smashboards) for Ridley-X roar, some of the sounds and victory fanfare; drogoth for fixing Side B; SoulOfSmash, Capt., GerbilCrab475, PrinceGal3n, NXero, ggmonx, MerryShadow, Dastardly Ridleylash, GanonFist, Weiss and Warzenschwein (all of them from smashboards) for beta testing; Dastardly Ridleylash (Smashboards) and MerryShadow (Smashboards) for some minor coding and image editing help; PyotrLuzhin (smashboards) for future .rel ports, RSBE01.gct codes help and RSBE01.gct file included; SchAlternate (smashboards) for improving textures; Dr. for fixing and optimizing the model; pikazz for Side B coding. 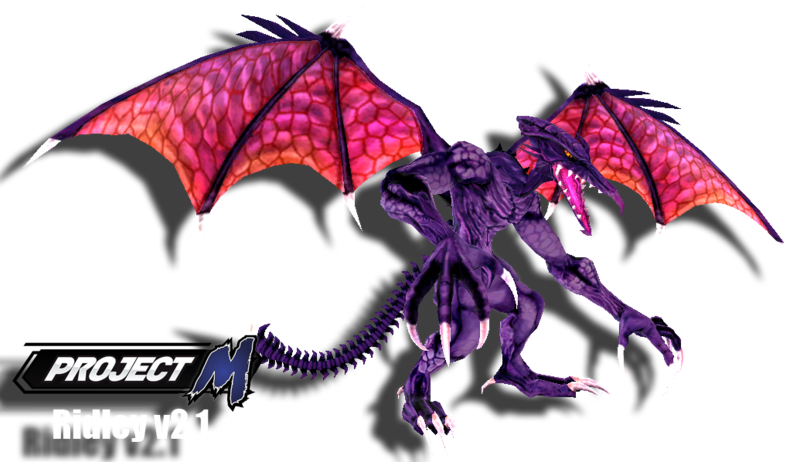 This is unofficial mod that replaces Pit (later, BrawlEx port will be made for Brawl, but unless he will become official for Project M, you will have to replace Pit to use him in Project M) with Ridley from Metroid series. 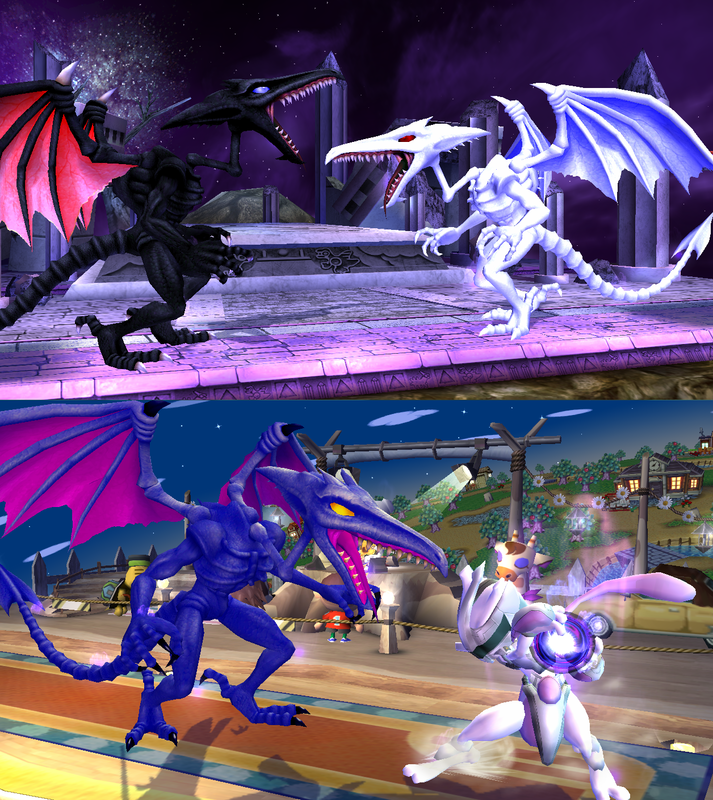 Ridley's appearance in this mod is mostly based off Other M Ridley, but with several noticable differences (such as shorter head with beak curved down, chin spike, longer spikes on the head, smaller wings, shorter tail with arrowhead-like blade on the tip, no spikes on legs and arms, etc) that make him look more like Super Metroid Ridley. Sounds are mostly taken from Metroid Prime and Super Smash Bros. for WiiU, with few Other M and Metroid Prime 3 sounds used. Jumps height - above average. Running speed - a big higher than Bowser's. Walking speed - near Samus' speed. The leader of the Space Pirates, Ridley, joins the fight! Armed with only his own natural weapons, he is a force to be reckoned with in the hands of an experienced player. 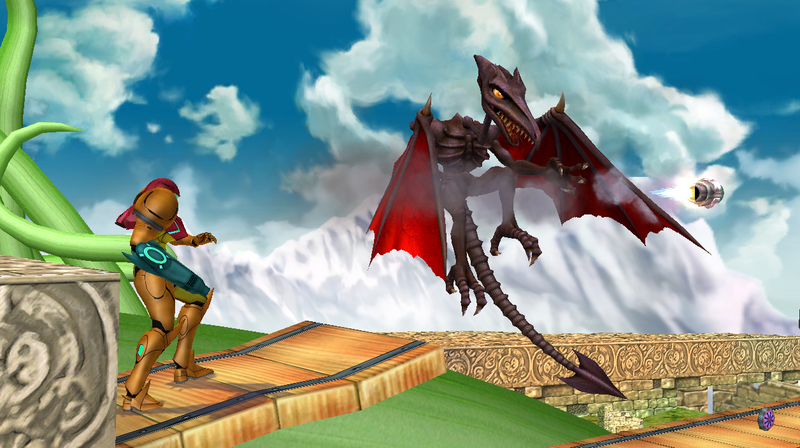 Thanks to Ridley's large size, long arms and tail, his range is very high, allowing him to reach opponent easily. His tail lacks hurtboxes and doesn't clashes with other attacks, so, it can be used to safely reach opponent. Most of Ridley's attacks deal high damage and knockback, which makes KOing opponent rather easy with proper reads and positioning. His high aerial mobility allows him to perform Wall of Pain and follow up other attacks without much problems. Because of it, its recommended to fight in the air rather than on the ground, but if its either not possible or its not the best course of actions in certain situation, then you still can use such attacks as Side Smash, which can KO most of the characters in 2-3 hits, Side B, which can be followed up by various attacks in similar way to Ganondorf's Side B, Down B, which has high knockback and goes through most of attacks thanks to its high flinch resistance, and many other attacks. Ridley also has a strong and fast projectile that can either be shot straight forward or diagonally down and if it hits the ground, it produces a big shockwave that launches opponents up, but deals lower damage and has low knockback growth. Most of Ridley's tail attacks deal extra shield damage, with fully charged Side Smash being able to shatter full shield on most characters. While he is the 2nd biggest character, he is far from heavy. Being a flying creature with a rather thin build, he is just barely heavier than Peach. This makes survival for Ridley a huge problem. Thankfully, his recovery allows him to survive being launched very far away from the stage, so, unless he is launched far enough to be KOed (something that is easy to do with such large and yet light character), he will most likely return. But his size might be a problem when recovering since this allows most of the meteor smashes to hit him easily. His recovery is also rather predictable and slow and he has low falling speed. 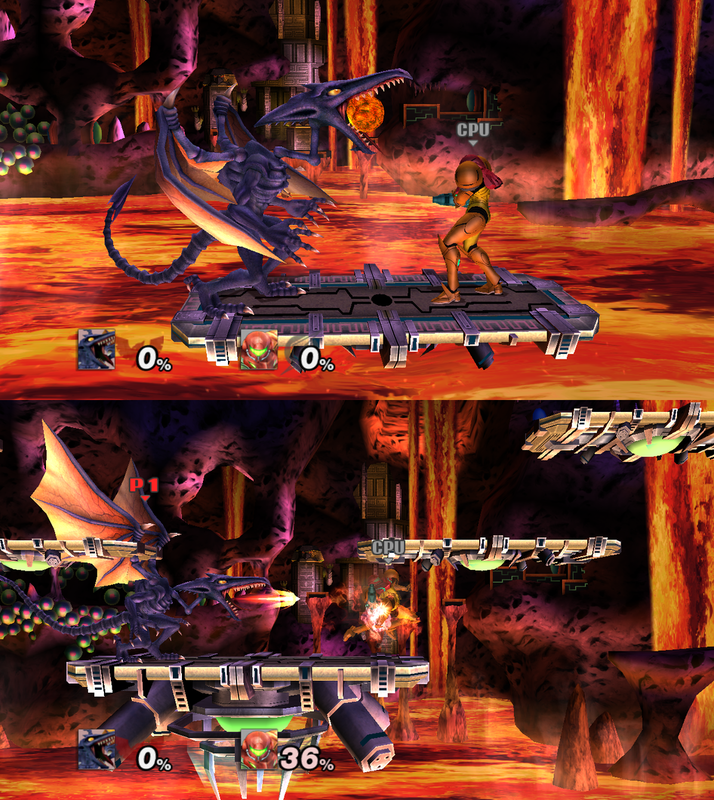 Another one of Ridley's problems is his slow ground attacks and low running speed. While his attacks are strong, they either have long start up or eng lag. His command grabs both on the ground and in the air are very fast and can be followed up by various attacks, but have high end lag and very low hitbox duration. His Side Smash deals very high damage and knockback, but has high start up and low hitbox duration. Overall, Ridley is a glass cannon and once you learn how to fight him, he is very easy to deal with, but most of your mistakes will be severely punished. That's a pretty good size. Update: finished ground versions of Down B and Neutral B. Neutral B - replaced fireballs and now at the end of animation, he bites anyone who is too close to him. I have only 2 issues with those - 1st neutral B fireball (every other go as they should go) gets stuck on one of his fingers on right hand and down B fireball is too small. I will fix those before starting to work on other animations. Bulls**t shows up more and more as i make it. I will still finish this project. I will change angle a bit when i will make other colors. 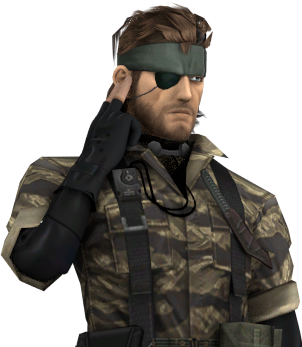 Or i will keep original CSPs. Also, i can't post videos because youtube doesn't works for me right now. good luck and incase you didnt know ridley and metaridley almost share the same boneset with some tweaks here and there but that is an experiment for when themoveset is close to completion once you got all the animations down i could try and fix some of the issues like items grabbing and such but only when you have all animations down. Thanks and i know about Meta Ridley having similar boneset. He lacks some bones (like one of those wing bones on each wing, one of the fingers on each hand, etc) and his legs, tail and wings have different translation values. I finished his AAA combo few minutes before posting this reply, so, i think i will finish him before next year. Since its an update for the progress, i don't think it should be considered a double post. 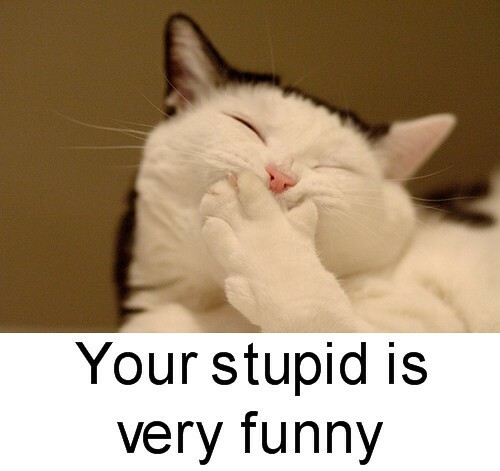 If it is, then WTF and sorry. Also, this project is now Project M only because i went over animations file size limit, so, i had to remove few animations. He will enter T-pose when trying to use this animation, so, don't use him in normal Brawl, stages not from Project M that have ladders or Subspace Emissary. So, i think it should be moved to Project M customized content. I wouldn't count that as bad news, but not good news either. To fit Project M, i will replace few attacks with faster attacks, like Up Smash, and increase speed of few other attacks, like up throw, forward throw, side smash, etc. This is gonna be awesome. Posting for Metroid support. And make sure you go over coding for attacks. You might be able to shorten your syntax a bit as you learn more. fitmotion doesnt care about psa codding and ridley psa file is preety low, what can happen is if the pcs and fitmotion are too big in conjunction this will also cause issues and such. Most of the time, it messes up animations (especially dash attack), so, i won't use that. Not just issues. It crashes the game in this case at least. Because Ridley is too big lol. Added sword trail effect to his claws and tail during attacks (for some reasons, it isn't properly seen from certain camera angle, but i hope i will fix that). I recently noticed that his shadow is really messed up. I don't know how to fix that. clean only messes up very specifiq animations on all the others you can click clean and play them to see if they still look like they used, if you dont use clean its obvious fitmotion will go trough the roof. Most ppl animate and when the animation its done click save, then click clean if the animation is still the same save again if it isnt just reload the motion file. In my case, most animations are messed up, not just few. If there won't be any other way to reduce file size when it will become too big (lol), i will try to use it. Already done. Its more like Red Eyes White Dragon and Blue Eyes Black Dragon, but it can be easily fixed. you can also get some space by deleting or replacing(not sure if model data being deleted there would cause a freeze or not its a matter of experimenting) model data 0 and modeldata 10 on the fitmotion they are under fitcaptainetc that should give extra space.